This cake recipe is not an original, but it is special at our house. It comes from the essential baking cookbook by Murdoch Books, and it has become my son’s signature cake. He has made it at least 5 times, most recently for our anniversary. I am generally not a big fan of cake. I usually prefer cheesecake or cookies. But this cake is so delicious. Its lemony sweetness and moist texture have made it a big hit with everyone who has had the pleasure of eating a piece. (I’ve had 3 pieces just this week, but thankfully my son took half of it to share with friends on the first day of school). I still remember the first time my son made this cake. The recipes in this cookbook are geared towards countries where metric measurement and Celsius temperatures are the norm. He didn’t read carefully enough and set the oven at the first temperature indicated, which was 180° – at that time he was not experienced enough of a baker to know that most cakes bake at 350°. Once we figured out why it was setting up and turned the temperature up, it turned out just fine. In fact, I think that first cake was moister than any of the ones he has made since. Anyway, if you are looking for an elegant but delicious cake for a party or potluck, I highly recommend this one. But be prepared to not bring home any leftovers! Preheat oven to 350°. Lightly grease an 8 inch spring form pan (or a regular round cake pan). Line the bottom with baking paper. Sift flour into a large bowl and add the coconut, lemon rind, sugar, butter, eggs and milk. Mix well with a wooden spoon until smooth. Pour into the cake pan and smooth the surface. Bake for 40 minutes, or until a skewer comes out clean when inserted in the center of the cake. Leave the cake in the pan for 5 minutes before releasing the spring form side of the pan, or turning out of the cake pan, and setting on a wire rack to cool completely. For the coconut icing, combine the powdered sugar and coconut in a bowl, then add the lemon rind and enough lemon juice to make a stiff but spreadable icing. Spread the icing over the cold cake. Note about the coconut: The original recipe calls for desiccated coconut, which I think is unsweetened, but we can never find it and have always used sweetened angel flake coconut. This entry was posted in Christian Living and tagged Baking, Coconut, Cooking, Eating, Family, Food, Lemon, Lemon Coconut Cake, Life, Love, postaday2011, Recipe, Recipes. Bookmark the permalink. I haven’t made many cakes since the boys left home, but I’ll try this one. I love lemon and coconut. I’m making a note to self to come back and share the findings. Thanks for sharing this one. 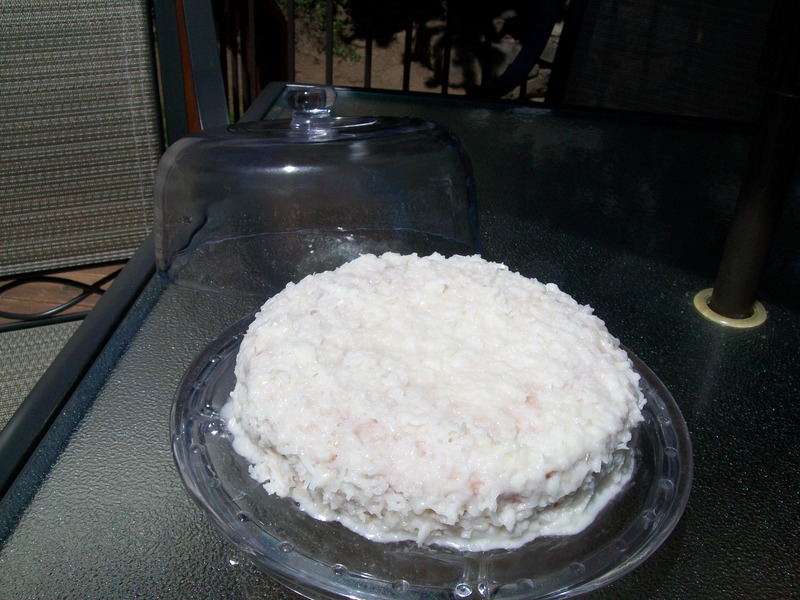 Coconut is one of my favorite types of cakes. Rum being the other. (Ha, you needed to know that.) Anyway, this looks amazing! Wow–that cake looks so delicious. I wasn’t sure where to comment on the Pantoum. It is also lovely. A great effort that works well. This sounds and looks delicious! As the temps begin to cool some, it is putting me in the baking mood. 🙂 Thank you for sharing this one with us! God bless you and your sweet family!